Looking for a new bicycle handlebar bag for your next bicycle tour? Here, I compare the 10 best bike handlebar bags for touring so you can choose which handlebar bag is best for you. 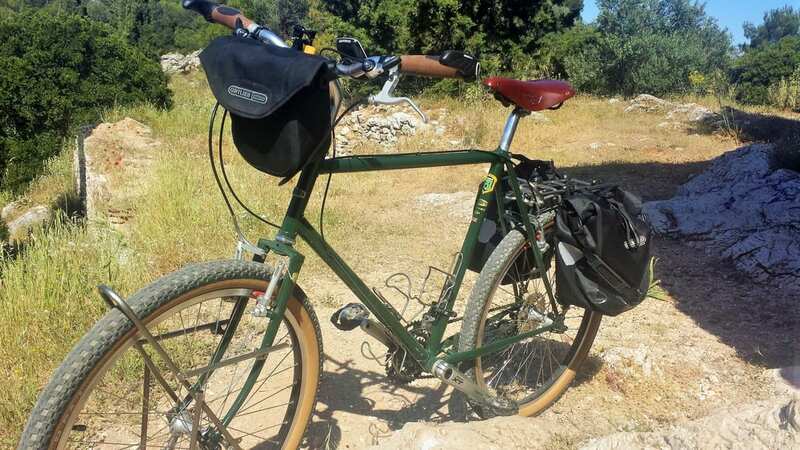 After completing my most recent bike tour in central Greece, I decided it was time to invest in a new handlebar bag. For a few years now, I've been rocking the Ortlieb Ultimate 5 compact handlebar bag, and even though I used it successfully when cycling from Greece to England, I knew it had its limitations. Although it's completely waterproof, and has given me zero issues, its limitations lay in the size. It's just not big enough (story of my life really haha). I wanted to be able to fit just a little more inside the small handlebar bag , such as perhaps a camera, more day snacks, maps and powerbanks. I'd been eyeing up the Ortlieb Ultimate 6 classic handlebar bag for sometime, but rather than rush in and buy one, decided to compare 10 handlebar bags suitable for bike touring. It became apparent that a few things had changed in the bike touring world since I last looked at handlebar bags, so I decided to write this guide to choosing a handle bar bag to help others in the same position. 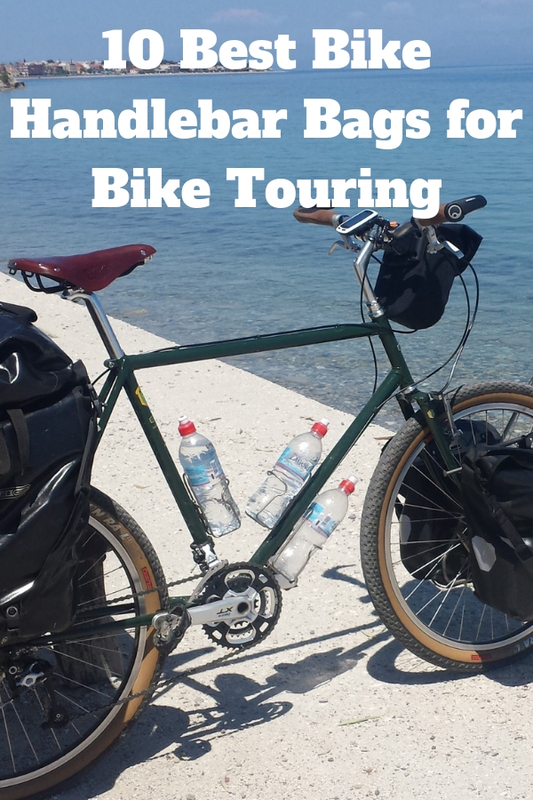 I'll explain the different sort of handlebar bags available, what I am personally looking for in a handlebar bag, and go through the pros and cons of each of the 10 best handlebar bags for touring I've found. 10 years ago, people were experimenting with making their own frame bags. A few small manufacturers were releasing items, but the concept was very much niche. Roll forward to 2018, and the bikepacking industry has exploded. Bikepacking is really a complete subject of its own that I want to write about in the future. For now though, I'll just limit my thoughts as to how bikepacking has directly affected the type of handlebar bags on offer for bike touring. Most bikepacking setups do not use a handlebar bag. Instead, they use a waterproof roll bag which most commonly contains a sleeping bag, tent, or tarp. I'm definitely not looking for something like this, so I've discounted these from my 10 best handlebar bags for touring. I have noticed though, that bikepacking has affected the way that some manufacturers have approached designing their handlebar bags. Cylindrical handlebar bags are starting to break onto the scene, and roll-top multi-purpose handle bar bags are also emerging. Personally, neither of these two developments in bike handlebar bag design do anything for me. I'm far more interested in the day to day practical aspect of using the handle bar bag and how long it will last than the latest trend. So, what is it I'm looking for in a handlebar bag then? Well, it's got to be waterproof. That's a no-brainer. I prefer simple yet sturdy designs. It has to be detachable so I can take it with me when parking the bike. I want to keep my daily snacks and other items I use when actually cycling in it. The handlebar bag should be long lasting. It should have a proven track record. I'll be upfront with you now – the answer really is Ortlieb! Still, it was fun looking at the other types of handlebar bag available online. Note: I've been hearing great things about Arkel bags. I couldn't find them on Amazon, hence they are not listed below. Here then are 10 of the best bike touring handlebar bags. I've listed them in an order from what I consider to be the best downward. As always I'd love to hear from you, so feel free to leave a comment at the bottom of the article! For cyclists outside of the USA, Ortlieb is the number one choice for bike touring bags. This German company produces hard-wearing, incredibly waterproof products that last for years and years. When it comes to handlebar bags, the Ortlieb Ultimate 6 is their number one offering. This bar bag does come in two sizes which are Medium and Large, but most people find that the medium bicycle front bag is more than adequate for their needs. Unlike some bags, this is a waterproof handlebar bag due to the materials it is made of. So, no need for additional rain covers. The Ultimate6 handlebar bag is compatible with several other systems from Ortlieb, meaning that you can attach map cases and mobile phone holders. The large storage capacity, and the tried and tested design which has fundamentally changed little over the last 10 or even 20 years makes the Ortlieb one of the best bicycle handlebar bags on the market. I've personally used Ortlieb bike touring products for many years such as the Ortlieb Back Roller Classic Panniers, and have no complaints. Balance out their slightly more expensive nature against how many years they will last, and you'll end up with a bike handlebar bag that offers great value for money. Vaude are another European outdoor brand which have a range of bike touring products to choose from. Their Vaude Road 1 Bike Handlebar bag is worthy of consideration. A classic look and lightweight, the Vaude handlebar bag is available in several different colours, and like the Ortlieb comes with a carry strap so you can take it with you when locking the bike up. In my opinion, the real let-down with the Vaude bar bag is that the materials it is made of are not waterproof. Instead, additional rain covers (provided) need to be put on. Still, the Vaude is a well respected brand, hard-wearing, and normally comes in a little cheaper than the Ortlieb bags. Brooks of England are most famous for their bicycle saddles such as the classic Brooks B17 saddle and the Cambium C17 saddle. They do make a range of other items suitable for bike touring though, one of those being the Isle of Skye Handlebar bag. Now I'll be honest and say that this handlebar bag from Brooks has something of a hipster feel to it. Is this really the best bike handlebar bag for long distance bike touring? The phrases ‘water resistant' are used instead of waterproof, and somewhat remarkably it weighs even more than the Ortlieb handlebar bag – Quite a feat! Still, this bicycle handlebar bag might appeal to those looking for a more stylised look to their bike touring equipment. It seems you can't get away from this Ibera handlebar bag when looking on Amazon! Touted as a bicycle handlebar camera bag it seems to tick all the boxes for people looking for a bar bag for their camera gear. Or does it? Again, the material is only water-resistant and the bag is supplied with a rain cover. Would you really want to risk your DSLR camera in a handlebar bag that may absorb water rather than repel it? Something to consider. The price point is very attractive though, making it a nice entry-level handlebar bag for touring. If you are more of a fair-weather cyclist and are looking for a way to take your camera equipment with you on short bike tours, perhaps the Ibera bike handlebar camera bag appeals to you. The name is something of an indicator that this waterproof handlebar bag is not aimed squarely at the bike touring market. Designed to be a bag you can attach to your bike, and then easily remove and take with you when you reach your destination, it's probably aimed more for day riders, commuters, and weekend cyclists. With that said, Thule are a respectable brand who do make quality products. In terms of bike touring though, I think the roll-top is a bit of a let down. Given the pricing points for the Thule handlebar bag and the Ortlieb are similar, I'd probably want to stick with Ortlieb. Topeak are a well respected brand in the cycling world, perhaps most famous for their Topeak Alien 2 Multi-Tool. They have several offerings when it comes to bike handlebar bags, with the best being their Tourguide Handlebar bag. Visually, I'm sure this will appeal to people who like to see lots of pockets on things. Already, you can imagine which essential items you will be keeping in which compartments of the Tourguide handle bar bag. On a practical level however, I've found that more pockets with zips is not necessarily a good thing. There's more zips to break, more places for crumbs and rubbish to accumulate, and inevitably some compartments will be impractical. For me, the main issue is again the rain cover. Once cycle handlebar bags like this get wet (and it will despite the rain covers) they're never quite the same after. It might last a year or two, but lacks the longevity of the Ortlieb front handlebar bags. Altura are another well known cycling brand, and so I was somewhat surprised to see that their bicycle handlebar bag doesn't have any reviews on Amazon in the USA or UK. Perhaps they sell mainly through other stores or sites? I've owned a number of Altura products through the years, and whilst I think they offer good value for money, my feeling is they are a notch below Ortlieb products. Still, this waterproof bike handlebar bag does seem to tick all the boxes from what I can see, although the absence of reviews does puzzle me. There are also no product dimensions from what I can see. At the budget end of things, Roswheel do a range of differently designed handlebar bags. Out of the several front bags for bikes they offer, their ‘professional handlebar bag' seems to offer reasonable value for money. A couple of things do put me of about the Roswheel Handlebar bag though. The first one, is that it has a ‘roll top'. 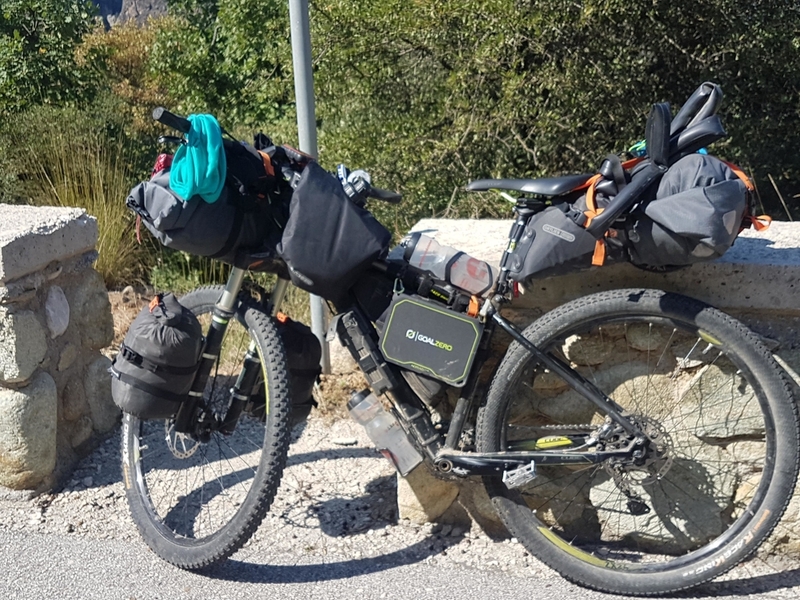 This is something a lot of new-players on the handlebar bag scene are introducing, but for bike touring it can be quite annoying. A Velcro top or even zip top really is a lot better for day to day use on a bike tour. The second thing that puts me off, is the Roswheel handlebar bag seems to have no product name. It smacks a little of being an Amazon FBA product, with little long term product testing or development. There's no arguing the budget price though, and it could be a good entry-level handlebar bag for bike touring, or even a nice handlebar bag for commuting. Another choice of bike touring handlebar bag to consider, is the very affordable Bushwhacker Durango Black. It's two compartments mean that you could separate food an electronic items, and the price is very appealing. The one drawback – and it's a major one – is that this cycling front bag is not waterproof. It's also unclear as to if it is supplied with rain covers. 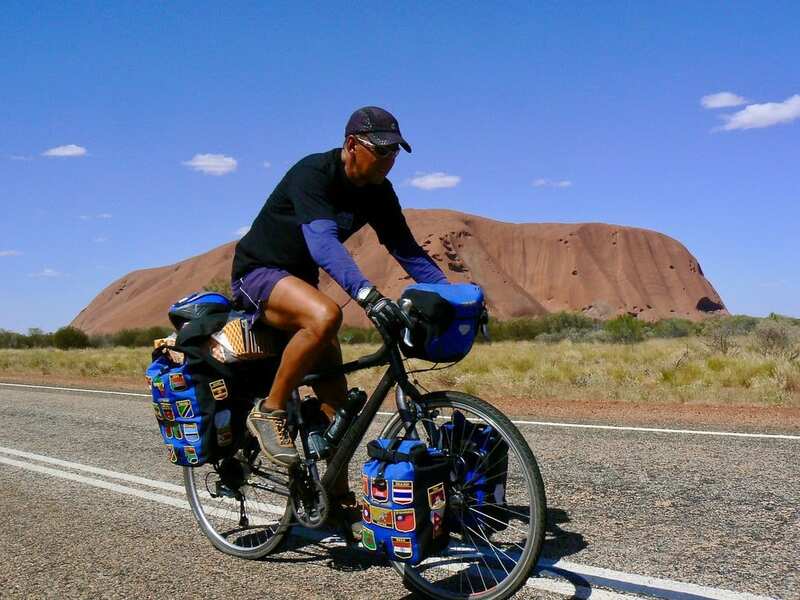 So, it might be a suitable product for casual cyclists and fair-weather bike touring, but certainly not up to the rigours of the road during a long distance bicycle tour. Dimensions: 10″x4″x6″ (LxWxH). Volume: 235 cubic inches. Finally, I am going to throw in one of the newer style of handlebar bags. After all, just because I don't think it's suitable for me, doesn't mean it won't work for you. In all fairness, this seems to be a very versatile bike. It can switch from being a bike front bag to a top tube bag to a shoulder bag very easily. With this in mind, it might appeal more to the bikepacking enthusiast out there. For me, the real downside is that it doesn't appear to be easy to access your day to day items. I'm not entirely convinced by the fixing system either. Still, the manufacturers do claim that it is a waterproof front bag for a bike. What about Rixen and Kaul? How can you have forgotten carradice? They do the super c canvas(which is signed inside by the woman who made it) and a carradry waterproof one.both are about 7 litres capacity,rectangular,have a solid base and sides,couple of pockets inside,and have a map pocket that’s removable on the top,fix to the bike using a quick fix clip that’s sturdy and easy to use. The only downside I can see is they’re quite expensive,but on the other hand if you can’t get on with it,lots of willing buyers will take it off you on eBay. Completely forgot about Carradice! Can’t say I’ve had any experience with their gear so far. Maybe to make up for it, I’ll buy a Carradice handlebar bag to test out later this year!